The shot clock is winding down on the short 2016 legislative session, and the future remains unknown for Washington’s eight public charter schools. With less than two weeks remaining on the legislative calendar, editorial boards from around the state continue to call on our state’s leaders to find a solution for the state’s charter schools following a Supreme Court ruling last year that declared the funding mechanism for these schools to be unconstitutional. Charters should be available as a legitimate educational alternative — especially for families and students in poorer households that have been underserved by ordinary public schools — until data show they are not delivering results. So far, results are highly promising. The schools already have brought together students, parents, educators and community members who have invested their time and toil to set up the schools. A number of individuals in the Yakima Valley have signaled that they would like to follow suit. The Legislature is letting down these committed charter school supporters — present and future — if they heed the critics who reflexively fear that something different just might be something better. Voters wanted charter schools as an option in this state. The Senate approved a bill that answered the Supreme Court’s concerns. The House Education Committee has deliberately let the issue languish and now seems to be obstructing a solution. A charter school fix was a key policy priority of the Roundtable to start the session, and it remains so today. We urge lawmakers in both parties and in both chambers to find a solution before session adjourns on March 10th. Yesterday’s update to the Benchmarks for a Better Washington shows that our state’s education system continues to produce mix results. Washington scores among the top 10 states in the nation in 8th grade math performance, ranking 7th overall. That success is tempered by the fact that just 39 percent of our students scored proficient or better on the nation’s math exam in 2015. Looking at other education metrics, Washington ranks 38th in high school graduation rate, despite an uptick in the graduation rate to 78.2 percent in 2014. And, we’ve moved closer to the bottom 10 states for bachelor’s degrees awarded per capita, ranking 39th with 4.6 degrees awarded per 1,000 residents in 2013. There are opportunities ahead to improve not only Washington’s education rankings, but to take actions that will lead to better outcomes for Washington students. In the short-term, the best opportunity is for state lawmakers to take action on legislation that will allow for the continued operation of public charter schools in our state. The Senate passed a charter school bill early in the legislative session and, with just two weeks left in the session, we’re getting down to crunch time. Public charter schools provide options and opportunities for students who have been historically underserved in our state, and, in just the first year, Washington’s public charter school students are making impressive achievement gains. It’s time to act and deliver a solution that will allow for the continued operation of these schools. Learn more about the charter school effort from the Washington Charter Schools Association and Act Now for Washington Students. To view the Benchmarks for a Better Washington, click here. How does Washington rank on key issues like innovation, education, transportation, and business climate? Find out in the latest update to the Benchmarks for a Better Washington, released today by the Washington Roundtable. 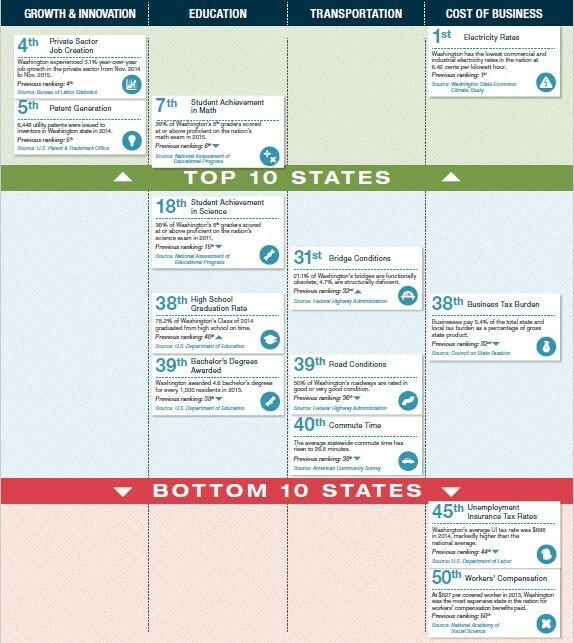 The Benchmarks that tells us exactly how Washington ranks on a set of 13 key data points, as compared to the other 49 states. Our goal? Make Washington a top 10 state for quality of life and innovation while ensuring it is not one of the 10 most expensive states in which to do business. Washington continues to be a leader in growth and innovation, ranking 4th in private sector job creation and 5th in patent generation. Our education system continues to produce mixed results. Washington ranks 7th in 8th grade math performance, a slight decline from the previous ranking, though still in the top 10 states. Our state continues to rank among the bottom third of all states based on high school graduation rates (38th) and bachelor’s degrees awarded per capita (39th). Washington falls to 40th for average statewide commute time (now 26.8 minutes). Washington drops down to 38th for business tax burden. The state and local business tax burden is equal to 5.4 percent of gross state product. The Benchmarks tell us where Washington stands today on these key metrics and remind us that hard work is needed to catch up, keep up, and move ahead. See the full report, including an in-depth Fact Sheet at waroundtable.com/benchmarks. A large, passionate crowd — young and old — braved the weather on Friday to travel to Olympia in support of a bill to fix public charter schools in Washington state. The House Education Committee opened public testimony on SB 6194, a bill to fix the way these schools are funded. (Last September, the Washington Supreme Court declared the previous funding mechanism for public charter schools to be unconstitutional.) During the hearing, parents, students, and faculty told success story after success story, and pleaded with committee members to keep open the doors of their schools. Less than three weeks remaining in the 2016 legislative session. The House Education Committee has scheduled executive action on the public charter schools bill next Thursday, February 25th. Stay tuned here for updates, or follow us on Facebook and Twitter . Act Now for Washington Students also for more on the issue, including an online petition where you can voice your support for public charter schools. Check it out.